For many years, MBA recruitment fairs have served as a valuable marketing channel for business schools. It’s a great way to meet and build relationships with prospects. However, MBA admissions officers have increasingly wondered about the cost/benefit with more miles to cover throughout the world and fewer resources back at home. For starters, there are registration fees, travel expenses, and the shipping costs of marketing materials. At the same time, the fairs can often pay for themselves with just one matriculated candidate – not to mention the added ROI of brand awareness. Several weeks ago, I attended a MBA recruitment forum in Washington D.C. to see how things have changed, if at all, since I worked behind the table at MBA fairs here and abroad. In this age of digital communication, it was reassuring to see that face-to-face relationship building is alive and well with the same branded tablecloths, stacks of market materials, and eager candidates lined up to talk to admissions representatives. As I scanned the room, I took interest in the range of “giveaways” that schools had piled on their tables including branded pens, notebooks, iphone stands, and Executive MBA mints. With the January cold, I was especially excited to discover a branded Chapstick-like lip balm which I was eager to put on until an MBA admissions officer from Virginia Tech (VT) kindly informed me that it would turn my lips orange in the spirit of VT’s colors. Now that’s memorable marketing. What perhaps captured my attention most of all, however, was the clever and engaging sign from Chapman University pictured on the right. It made me think of a recent article I came across, “The Science Behind Why Every Buy is an Emotional Buy” and how the lessons in this article tie directly to MBA recruitment. The article continues by saying that, above all, buyers are humans. Chapman’s sign conjuring up images of warm sunshine connected on an personal level with weather-weary Washingtonians. This Valentine’s Day – and all throughout the year- think of ways to draw emotional connections with MBA prospects in your business school marketing channels. That means not only MBA recruitment fairs, but blogs, social media, brochures, website content, and lead nurturing campaigns. 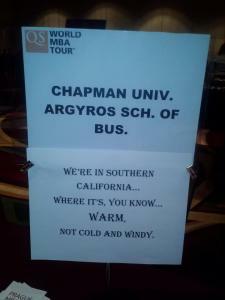 MBA prospects aim to leave a lasting impression with business school admissions officers at MBA forums. Be sure to do the same thing with MBA candy-dates for sweet recruitment results this Valentine’s Day and all year round.